QCT offers a family of servers for different types of scale-out storage clusters, optimized with Red Hat Ceph Storage for different workloads and budgets. The SDS solutions deliver seamless interoperability, capital and operational efficiency, and powerful performance. Delivered in one self-healing, self-managing platform with no failure, QCT QxStor Red Hat Ceph Storage Edition makes businesses focus on improving application availability. QCT servers are offered in a range of configurations to allow diverse workload optimization – IOPS optimized, throughput-optimized and cost-/capacity-optimized configurations. Ranging from dense, 1U systems to models providing massive storage capacity, servers enable Ceph journaling by providing expansion slots for PCIE SSDs or specially designed spaces for SSDs. Unlike scale-up storage solutions, QxStor Red Hat Ceph Storage Edition lets organizations scale out to thousands of nodes and scale storage performance and capacity independently, depending on application needs and storage server platform. Enterprises are increasingly seeking to emulate the efficiencies achieved by public cloud providers but with the increased security, control and flexibility of private and hybrid cloud environments. By collaborating with QCT, we are aiming to bring our joint expertise to customers looking for OpenStack and Ceph-based cloud environments, with confidence that our solutions have been jointly tested and validated. 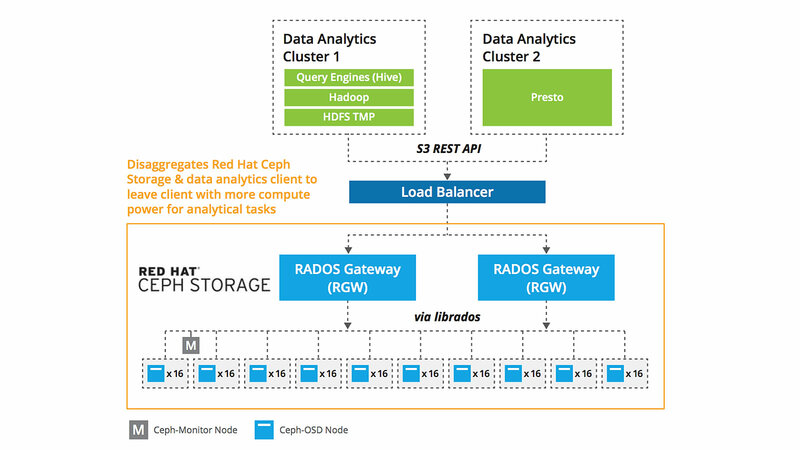 QCT designs an optimized Ceph configuration for data analytic workloads, meeting the flexibility, scalability and performance requirements for Hadoop and big data frameworks. Disaggregated architecture allows users to expand independent resource pools according to actual needs, achieving better optimization and efficiency of purchased appliances. Moreover, big data analytics data lake with all-flash Ceph ensures identical performance results to that of Hadoop hyper-converged architecture, making it perfect for large- scale data analytic tasks. Extensive QCT and Red Hat testing reduces the risk out of deploying scale-out, Ceph-based storage solutions. Cost- or capacity- optimized configurations provide industry-leading density. Innovative QCT server platforms are easy to deploy rapidly at scale. For throughput-oriented workloads, both QCT QuantaGrid D52T-1ULH and QuantaPlex T22P-4U servers with Ceph replicated pools enable organizations to use a range of different cluster sizes. For object archive workloads, QCT QuantaPlex T22P-4U servers with Ceph erasure-coded pools provide competitively priced storage. Get more information about QCT Solutions!